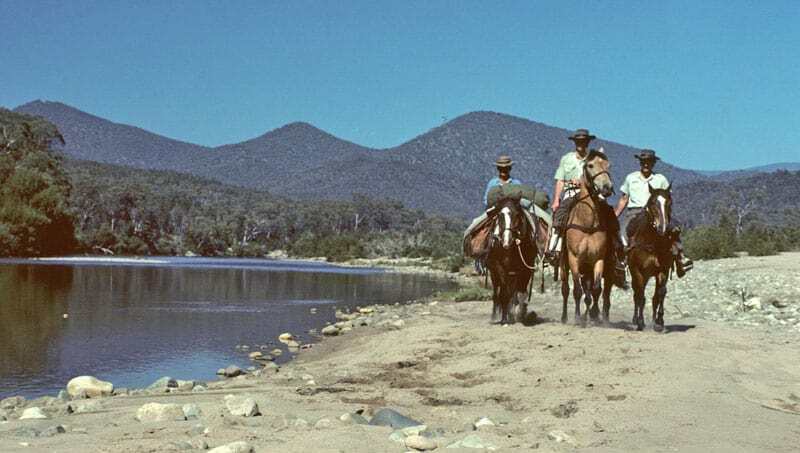 Horse Patrol on the lower Snowy River, 1978. I grew up riding horses on a property on the south west slopes of NSW in the 1970s. I became a backcountry ranger over the summer months. My job included remote area horse patrols. Riding the four corners of the amazing and diverse Kosciuszko landscape was an incredible new experience for a lad off the relative flat country on which I grew up. When my farmer dad asked me what I had been doing as a ranger on my first trip back to the farm I tentatively replied, “Umm, impounding illegally grazing sheep and cattle”. His response with a pointed glare was “What!” But as a farmer he eventually began to appreciate the importance and significance of the work of a ranger as a land manager, particularly in relation to the management and control of feral animals. Those early horse patrols also included monitoring illegal brumby running, as well as compliance of conditions under brumby running permits issued for groups in Jindabyne and Tumut. The permit system was a means of accommodating traditional interest in buck running – as we called it – rather than as a means of controlling horse numbers. Permits allowed for the removal of a limited number of horses by chasing on horseback and capturing using ropes or running small numbers into traps. Some people today argue that brumby running is a ‘humane’ alternative to culling for reducing horse numbers. But I saw horses that had been injured and killed by brumby runners. Snares were sometimes used with cruel results, including a slow death. Brumbies with barely treated wounds appeared in local saleyards. We occasionally had to euthanise horses severely injured and left by the brumby runners. Ranger staff eventually recommended that the brumby running permit system cease due to cruelty and other issues associated with buck running camps. In the 1970s a mob of brumbies was an uncommon sight. A single mob would disappear quickly into the bush with the stallion mustering from behind. Camping on patrol in remote locations was sometimes a sleepless affair as you had to be constantly on guard against yards being kicked in by the local stallion to “rescue” your horses. It was a disturbing sound to hear your horse disappearing down the plain at three in the morning, hobbles clanging in the frosty, but hopefully moonlit night. Now in most areas there are so many horses that fights between stallions in neighbouring mobs are more frequent and the sheer pressure of numbers is sending horses into camping areas. Tantangara Plain today is a different place to Tantangara Plain in the 1970s. Where I used to see maybe one stallion and one mob of horses disappearing into the distance, now I often encounter 10 to 15 mobs. I compare the occasional brumby track crossing a creek in the 1970s to a myriad of horse tracks today. The sight of mountains of horse manure beside creeks, and the knowledge of their effect of the high nutrient levels on the creeks and ecosystems, makes me worried about the future of the national park. When I was on patrol as a young ranger, we would occasionally come across the carcass of a horse that had suffered a painful death due to injury or severe weather conditions. Now large numbers of horses are dying from starvation on the Snowy River. A horse needs such a high volume of food compared to any native animal. Horses are not adapted to an ecosystem where periodic droughts or heavy snowfalls restrict the available food. I talk to many local horse riders who are appalled at the incredible damage caused by the high numbers of feral horses and agree that culling is necessary. Many of my riding friends say they feel intimidated by people who assume that, as riders, they will naturally be opposed to culling and will without question support the brumby bill. Enjoying and protecting Kosciuszko is as important to the riders I know as it is to other visitors to the park. I have followed a program developed by an experienced and respected horse trainer that involved disadvantaged kids in training of horses removed from national parks. The positive impact on the lives of those kids was remarkable. Lives have been turned around through the development of trusting relationships between the kids and the horses under their care. I strongly support such programs. As a way to reduce horse populations in the park, however, these programs are most definitely not an effective alternative to culling. The number of horses that can be removed and used in such programs or eventually re-homed is nowhere near enough. There is some discussion as to the term that should be used to describe ‘wild horses’ in Kosciuszko or in natural areas generally today. For me there are two very different images – a distant memory of a single mob of “brumbies” or “wild horses” disappearing into the distance, and the now huge mobs of feral horses destroying alpine ecosystems. Out of control pests whether horses, deer or pigs are destructive feral species requiring effective and appropriate control to reduce their impacts.